Google AdSense is a money making project. I was making from $200 to $250 PER DAY in 2015 with this entire methodology. Indeed, I know some individuals winning more than $200,000 every month with Google AdSense and the great things is that you can have it as a part time business. The more interesting thing is that Google AdSense have no earning limitation. 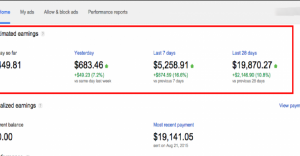 So how you will make money $200 with AdSense! It is a question, right? Ok, I will tell you the secret to earn thousands of dollar with AdSense. A good quality website with high quality hosting provider. Write informative articles, post suitable photos or videos. Make a Facebook page and grow a huge number of visitors. Invest money to get more money. Ok, this is the requirements, so now allow me to say the details. Google AdSense is the most famous and trustable ad network in the world. When you write original content and visitors will love to read it, AdSense will place ads on your website and you will get money. Is it clear to you? So how much you can earn from 1 thousand visitor? Ok, suppose you get 1K visitors in your blog or website and now the question is how much Google will pay you. Actually AdSense earning depend on click, country, Ad Company and many things. From my own experience I got $55 from 1K visitor. Is it enough to you? Ok, I can ensure you, you will get $3 to $40 from one thousand visitors. So how many visitor you need to get $200 in a day with Google AdSense? I mention earlier, AdSense earning depends on many aspect like country, company, competitions and a lot. In my own opinion view, if you have 50K visitors you will earn $200 is a day with AdSense. When I was writing this article I was just checking my earning and it shows I have $150 from 9k visitors. Is it interesting to you?